The area code system was developed by AT&T and Bell Laboratories in the 1940's, and went into effect in 1947. It was called the North American Numbering Plan (NANP) and included the United States and Canada. States and provinces that had a single area code were assigned three digit codes with 0 as the middle number. There were 86 area codes at that time. States and provinces that had more than one area code distributed to them were given three digit codes with 1 as the middle number. The first and third digits were allotted according to population density in the city or region, with the most populated areas getting the lowest numbers. If you've been reading your mail lately, you may recall a letter from your local telephone company. This letter was about the new system of direct long-distance dialing which makes it possible for you to call Aunt Minnie in Minneapolis' just "by dialing 612, the area code number, plus her phone number. Ingenious new switching circuits make such long-distance dialing possible. But these fancy new techniques wouldn't be worth a nickel without a way of getting messages across the country quickly and economically. At the present time, we have two efficient carriers of the cross-country electronic mailbag. These are the coaxial cable and the radio relay systems. Some 16,000 miles of American real estate are covered by the radio relay towers of the American Telephone & Telegraph Co., while another 10,000 miles hold A T & T's buried coaxial cables. Through Earth and Air. Although one sends its messages through underground tubes and the other goes through the air, radio relay and coaxial cable use the same basic techniques to handle thousands of telephone calls at the same time. Network television programs are routed around the country on these same carriers, right along with your phone call. Actually, a coaxial cable and a relay antenna carry a broad band of frequencies. Some of the latest equipment covers eight times the frequency span of the entire broadcast radio band. An individual telephone conversation occupies only a narrow channel of the band, much as a single radio program represents only a part of the total signal picked up by your receiving antenna. In the same way that your radio receives and separates many stations, so coaxial cables and radio relay can carry an enormous composite signal and separate the many individual voice channels at the receiving stations and cable terminals. Why are there two systems? There are several reasons. First of all, the type of terrain to be covered can determine whether coaxial cable or radio relay should be used. In a mountainous area, radio relay is almost always called for, while coaxial cable is favored in open country. Another factor is local needs. Other things being equal, the system which best suits local traffic requirements at a given time will receive the nod. At one point in the game, radio relay may offer the greatest message-handling capacity; at another time, cable equipment may forge ahead. The costs of the two systems tend to average out. While radio relay is cheaper to install, cable is cheaper to maintain and operate. The two carriers of the cross-country electronic mailbag are the coaxial cable and radio relay systems. Above is an inside view of a coax cable. At right is an antenna tower at a radio relay station. 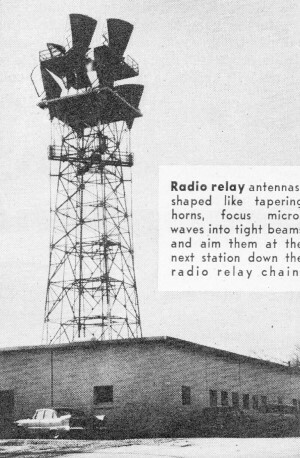 Radio relay antennas, shaped like tapering horns, focus microwaves into tight beams and aim them at the next station down the radio relay chain. Coaxial cable is made up of eight coaxial tubes plus a number of stand­ard wire conductors. Spacers made of polyethylene position the center wires inside the hollow copper outer tubes. 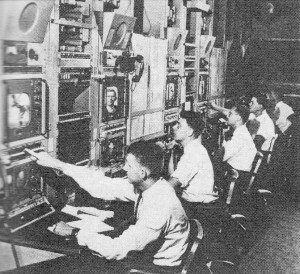 Television control terminals monitor programs coming in either on radio relay or coaxial cable. One TV program ties up the equivalent of 600 telephone circuits. "Mickey Mouse" plow train can cut through most types of terrain, planting coaxial cable and filling its trench as it goes along. The Cable System. Coaxial cable is a marvel of design. About as big around as a man's wrist, it's really a collection of eight copper tubes, together with a number of standard wire conductors for maintenance and short-haul telephone purposes. These are all encased in a gas-filled lead sheath. Each copper tube is roughly the diameter of a fountain pen. 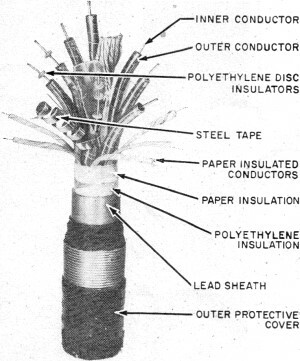 A copper wire runs down the center of each tube, held in place by polyethylene insulating discs spaced about an inch apart. Because the tube and the wire have the same axis, the tubes are called "coaxial." This design offers unusually good shielding properties. It prevents interference with other conductors. in the same cable and protects against outside electrical disturbances. For telephone purposes, the tubes are used in pairs - each transmitting in one direction. When equipped with the latest design of related apparatus, some 1860 simultaneous conversations can be handled by each pair of coaxials. Since signals carried by the cable weaken rapidly, a chain of booster amplifiers spaced four to eight miles apart is necessary to refresh them. Depending on the particular system, these repeater stations are mostly small, unattended units that draw their power from the cable itself. A series of main stations supplies this power and also provides overall maintenance. Automatic Trouble-Shooters. The cable has an amazing ability to look out for itself. Not so long ago, for instance, a farm hand in the South was digging post holes when he hit something. The man was startled when the mysterious object started hissing at him. He was almost as surprised when a Bell System maintenance man showed up in short order. The object our farm hand struck was, of course, a "coax." The hissing came from gas - either nitrogen or. dehumidified air ­ escaping through a break in the casing. The gas serves two purposes. First, by escaping under pressure, it keeps moisture from entering the break. Second, it sets off an alarm at a main repeater station and allows maintenance personnel to locate the damage from gauges that show the point of lowest gas pressure. Signal problems and power failure are other occasional sources of trouble in the cables. Here, too, the coax has built-in safeguards. For example, only six of the eight tubes are usually in operation. Two are kept in reserve for emergencies, one set to handle signals in one direction and the other ready to transmit in the opposite direction. If the commercial power should fail, batteries are automatically cut in. Should these go out, emergency generators take over. Different locations require somewhat different safeguards. In areas where the soil offers a high resistance to electricity, a polyethylene insulating layer wards off lightning damage. Where gophers are found, a wrapping of steel tape deprives the critters of a tasty lead-sheath snack. Radio Relay. Natural and man-made hazards are less of a problem with radio relay. Since it operates in the microwave frequency range, it isn't affected by static caused by lightning, nearby ignition systems, or even sunspots. A radio relay chain is made up of a number of stations about 30 miles apart. Each one must be within the line of sight of the station in front and behind, because the microwaves they handle are highly directional and are focused into extremely sharp beams. The relay stations are placed in a zigzag path rather than in a straight line, so that there is no danger of a station's overshooting its mark and being picked up by the next station down the line. Because it uses such tightly focused beams, microwave relay employs power very sparingly. It takes less than a watt - about enough to light up a pocket flashlight bulb - to span the gap between stations. The tight focusing arrangement also conserves frequencies at a station that feeds two or more relay chains. The station can send out the same frequency in different directions without danger of interference. In regular practice, however, a relay station receives a transmission on one frequency band and then converts it to another frequency for relaying to the next site. Here, the transmission is again sent out on the original frequency, and the alternation of frequencies continues right on down the line. This practice eliminates the possibility of part of a station's transmission feeding back into its own receiving antenna. The amplifiers that give the relay stations their punch really pack a wallop. They can take a weakened signal and send it on with a million fold gain in strength. As with coaxial cable, the radio relay system contains a number of built-in safeguards. It, too, has spare emergency channels for use in case of trouble. Storage batteries and motor-driven generators are ready to supply emergency power. An alarm system spells out any trouble on a coded diagram at the nearest control office. Multi-Purpose "Highway." Television and telephone traffic are carried together on both radio relay and coaxial cable. The average TV circuit ties up the equivalent of 600 telephone circuits. But, unlike telephone, it only goes one way, and thus uses only half the two-way circuits involved. Interestingly enough, the television picture and the audio portion of the show are normally carried on separate channels. This means that technicians in the control centers must coordinate the two sections of the program at the end of the line. Since the audio is carried on lower-priced lines, network television doesn't offer too much for the hi-fi enthusiast. 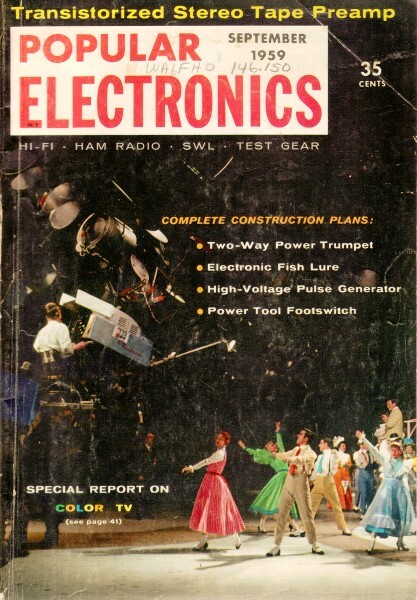 Bell Telephone can supply circuits with a top audio frequency response of either 5000, 8000, or 15,000 cps. The higher the response, the higher the price of the service. For this reason, though some TV circuits are occasionally rigged for the higher frequencies, the networks generally content themselves with a 5000-cycle audio cutoff. Regular telephone frequency response, incidentally, ranges from about 300 to 3000 cycles. Ground Work. A lot of planning goes into the construction of either system. For radio relay, topographical maps are used to locate clear paths between sites and to avoid reflective surfaces, such as flat land or lakes, that might harm the signal. Portable transmitters, receivers, and antennas are spotted for field tests of prospective sites. Borings and soil samples tell what kinds of foundations are in order. 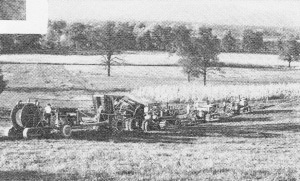 Cables are laid in open country by tractor-drawn plow trains. A 27-ton job, tagged the "Mickey Mouse," is the most powerful type in use. This monster's hydraulically controlled plowshare can cut through almost any kind of terrain, feeding cable into the ground and filling in the trench as it moves ahead. 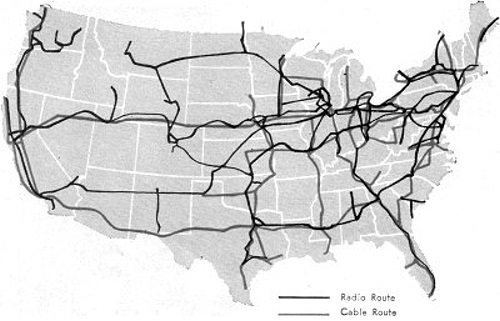 In cities, on the other hand, or under highways and railroads, the cable is generally placed in a conduit or pipe. Sometimes it must be run over bridges. Or, at river crossings where there are no bridges, the cable may be laid by barges and dredges using high-pressure water jets to trench it in the stream bed. Aside from consideration of local problems, the telephone companies think it is just plain good sense to use both radio relay and coaxial cable, instead of putting all their eggs in one basket, since a disaster that affects one system isn't likely to harm the other. This way, there is a good chance that an alternate route will always be available should something go wrong with the prime channel. And if this belt-and-suspenders approach is important under everyday conditions, from the viewpoint of national defense it could be a matter of life and death.